King of the Romans (Latin: Romanorum Rex; German: Römisch-deutscher König) was, from the time of Emperor Henry II (1014–1024), the title used by the German king following his election by the princes. 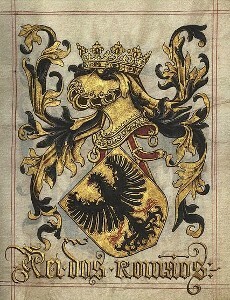 The title was predominantly a claim to become Holy Roman Emperor, a title, which in contemporary views of the Middle Ages, also had a religious aspect and was dependent on the coronation by the Pope. Contemporary sources did not refer to the territory of East Francia as Regnum Teutonicum (Latinised from Old High German diutisc, i.e. Kingdom of Germany) until the 11th century. During that time, the king's claim to coronation was increasingly contested by the papacy, culminating in the fierce Investiture Controversy: After the Salian heir apparent Henry IV, a six-year-old minor, had been elected to rule the Empire in 1056, Romanorum Rex became his standard title to emphasize the sacred entitlement to be crowned Emperor by the Pope. Nevertheless Pope Gregory VII insisted on using the derogatory term Teutonicorum Rex ("King of the Germans") in order to imply that Henry's authority was merely local and did not extend over the whole Empire. In reaction to Gregory's usage, Henry began to regularly use the title Romanorum Rex until he finally was crowned Emperor by Antipope Clement III in 1084. Henry's successors imitated this practice, and were called Romanorum Rex before and Romanorum Imperator after their Roman coronation. The title Romanorum Rex became functionally obsolete after 1508, when, after King Maximilian I failed in a good-faith attempt to journey to Rome, the Pope permitted him to use the title of Electus Romanorum Imperator ("elected Emperor of the Romans"). 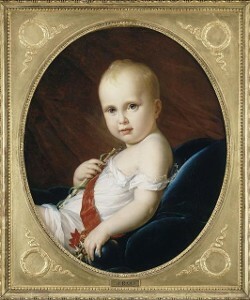 Maximilian also at this time took the new title "King of Germany" (Germaniae rex, König in Germanien), but the latter was never used as a primary title. The rulers of the Empire thereafter called themselves "Emperors" without going to Rome or soliciting Papal approval, taking the title as soon as they were crowned in Germany or, if elected as heir to the throne, upon the death of a sitting Emperor.